Air Niugini wishes to advise the traveling public that as a result of uncertainty created by recent volcanic activity at Kadovar and Biem Island in East Sepik, Air Niugini will temporarily re-route its Wewak flights , PX 126 and PX 123 to/from Madang and suspend aircraft overnights in Wewak . Effective Sunday, 21st January and up until 24th March 2017 , PX 126 in the afternoon has been rerouted to operate direct from Port Moresby to Wewak and then onto Madang where the aircraft stays overnight. This flight will depart Port Moresby at 2:50pm and arrive in Wewak at 4:10pm. It later departs for Madang at 4:40pm, arriving at 5:20pm. The daily morning flight from Wewak, PX 123 has also been rerouted to operate from Madang to Wewak and on to Port Moresby. It departs Madang at 06:00am to Wewak, arriving at 06:40am. It then departs Wewak at 07:10am and arrives back in Port Moresby at 08:30am. We encourage our customers to take note of the above changes. Air Niugini regrets the inconvenience caused. 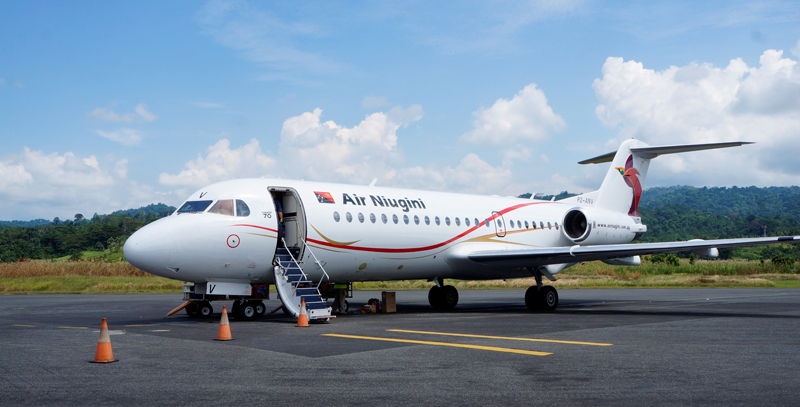 However, safety is always of paramount importance in Air Niugini’s operations.